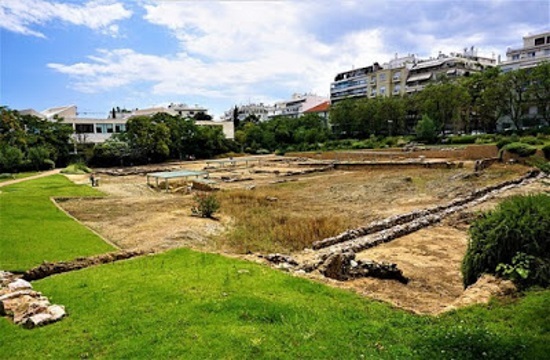 ATHENS – As he perused the ancient site of Aristotle’s Lyceum, opened to the public only in 2014 after being excavated in 1996, Simon Critchley, an English philosopher who is a professor at the New School for Social Research in New York City, said he was most struck by its garden. “Aristotle’s endowment allowed him to build a huge research and teaching facility and amass the largest and most important library in the world … there were as many as 2,000 pupils at the Lyceum, some of them sleeping in dormitories. The Lyceum was clearly the place to be, the educational destination of choice for the elites,” Critchley wrote for The New York Times. He said he was most taken with the garden, wondering whether it was just a place for walking and thinking or represented something on a higher, existential level, designed to draw out what was in a person’s heart and mind. “Looking now at the beautifully maintained site of the Lyceum … we are only now beginning to form a proper picture of the plan, architecture and function of the Lyceum,” he wrote after a tour, following a look at Plato’s Academy in the neighborhood of Kolonos, further away from the center. He said his eye was caught by the garden as he wandered among the ruins. It possibly led to the peripatos, or shaded walk from which the promenading Peripatetic school derived its name. What was the garden for? Was it a space for leisure, strolling and quiet dialectical chitchat? Was it a mini-laboratory for botanical observation and experimentation? Or was it, he said of what intrigued him most, an image of paradise? “The ancient Greek word paradeisos appears to be borrowed etymologically from Persian, and it is said that Darius the Great had a “paradise garden,” with the kinds of flora and fauna with which we are familiar from the elaborate design of carpets and rugs. “A Persian carpet is like a memory theater of paradise. It is possible that Milesian workers and thinkers had significant contact with the Persian courts at Susa and Persepolis. Maybe the whole ancient Greek philosophical fascination with gardens is a Persian borrowing, and an echo of the influence of their expansive empire. But who knows?” he wrote. Critchley said he is not a fan of gardens but that seeing the Lyceum gave him pause and a second thought. “Perhaps there is a much closer relation between gardens and philosophical thought than we might at first imagine,” he said. He noted at the end of the Nicomachean Ethics, Aristotle saws the promise of philosophy as the cultivation of the contemplative life, the bios theoretikos that would be the equal to the life of the gods. “What better place for this than a garden? Might not botany be the royal road to paradise, an activity at once empirical and deeply poetic?” he wondered of Aristotle’s intent. He said he and his partner identified thyme, lavender, abundant wildflowers, gigantic rosemary bushes, olive trees, cypress and possibly oregano and a carpet of moss with varying shades of green framed by the sandy yellow footings of the ruins.